During the Raj period, the Convention States of Chamba, Faridkot, Jhind, Nabha, and Patiala had postal agreements with Great Britain, allowing their stamps franking power throughout all of British India. Stamps of the Convention States were all overprinted stamps of British India, in contrast to the stamps of the Indian Feudatory States, which were issued independently, and which were only valid within the issuing states.The stamps of the Convention States are rich in varieties and errors. Typical errors include inverted overprinting, spelling mistakes in English or Devanagri, errors of omission and smaller capital letters. A number of issues from both the Convention and Feudatory States are quite scarce and desirable. While quantities issued information is generally unobatainable for stamps of the Feudatory States, there is some available for certain Convention States issues, quite a few of which have been overlooked. One such issue is Chamba's 1886-96 Overprints (Scott #1-15). 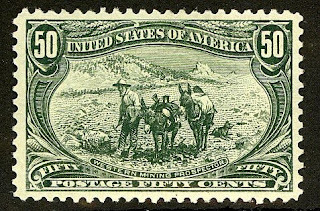 The 2r-5r high values of the set (Scott #12-14) had printings of only 672 each, and Scott '10 values the set unused at $ 710.75. It is worth focusing on just the top three values, if the complete set is difficult to find in decent condition. While fake overprints may possibly exist on the high values, this does not represent much of a risk, because the difference in value between the stamps overprinted for Chamba and the basic stamps of British India has not been enough to justify faking them. Until the last decade or so, most of the demand for stamps of India's Convention and Feudatory States has come from British Commonwealth collectors and specialists outside of India. With India's economic rise, its stamp market has been heating up considerably. I am confident that in the coming years, the center of demand for these collecting areas will shift to India, as the number of stamp collectors there will number in the millions, if not tens of millions.